How Do Nut Trees Disperse Their Seeds? 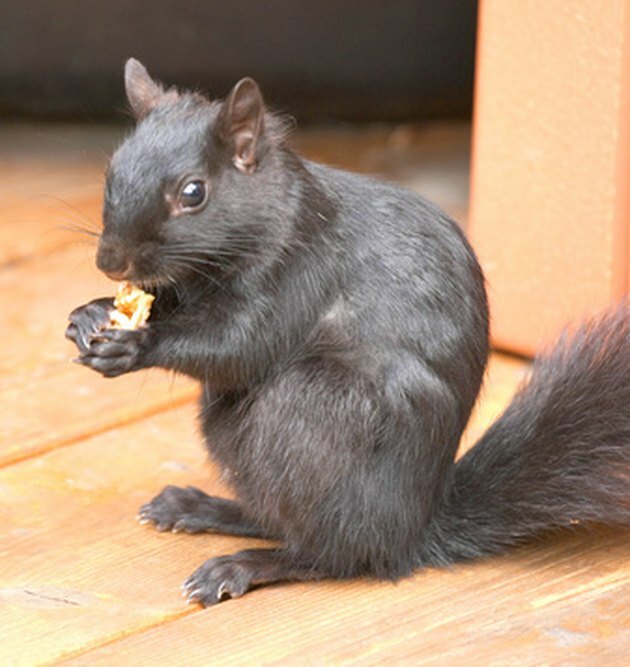 Squirrels go nuts for nuts because nature designed the quirky creature to be an effective seed dispersal unit. Of course, nature engineered other methods of seed dispersal such as water and wind. Each dispersal method achieves the biological imperative to remove the seed from the shadow of the parent tree. In doing this, the seed gets a fair chance at germinating. It also doesn't have to compete with an adult tree of the same species growing directly over it. Nut trees face the same challenges. Squirrels collect and move nuts, dispersing the nuts away from the parent tree. The average human considers many trees to produce nuts. Scientists bicker over the correct classification of nuts, calling some of the nuts drupaceous nuts because those nuts don't meet the botanical classification of a nut. Botanically speaking, a nut houses one or two seeds, wrapped in a hard outer layer that doesn't open on its own. The seed is not attached to the shell wall. True nuts include the hazelnut and chestnut. Nuts meeting the definition of a drupe—a hard layer surrounding the seed—include almonds, pistachio nuts, macadamia nuts, pecans and walnuts. Peanuts are classified as a legume. Nuts fulfill an animal's need for food and the tree's need to move the seed. For many nut-bearing trees such as the pecan tree, walnut tree and oak tree, animals primarily move the tree's seed to a location out from under the large, shady branches of the parent tree. Squirrels commonly perform this function by collecting the nuts and stashing them for winter. Some never make it into the squirrel's belly. The intact nuts germinate in spring. To a lesser extent, water disperses nuts away from the parent tree. This occurs during flooding. Fast-moving flood waters carry nuts to a new location. For a significant impact, the flood waters should occur in autumn. Water plays a minimal role in seed dispersal. Nut trees situated along a river, ocean, or stream also use water to transport the seed to a new location. The weight of a nut makes its nearly impossible for wind to play any part in seed dispersal. The wind does help ripened nuts to fall to the ground. In lightweight plant species, the wind literally carries the seed through the air to a different location. Wind transfers pollen for fertilization of wind-pollinated nut trees like the pecan. This pollination causes the nuts to be fertile and able to germinate in the ideal environments. Nut-producing trees include the oak, black walnut tree, California black walnut tree, pecan tree, butternut tree, macadamia tree, hickory, American chestnut tree, Chinese chestnut tree, hican tree, Filbert tree and Persian walnut tree. These trees produce the nuts most often seen in grocery stores, including walnuts, macadamia nut, chestnuts and hazelnut. From the hybrid hican tree, humans harvest hickory-pecans. What Are the Functions of Seeds in a Plant?